I’m stunned at my own brilliance, but then again, it is late at night and I’m best after midnight. The Light Rail route shown could of course be simply put underground here, just going slightly downhill in front of the apartment buildings on Kent Tce, passing under SH1 and being out of sight and sound near the Basin, and then rising up near Maccas on the other side, in Adelaide Road. All the school children can simply get the LR to school, and whenever there is a match on at the Basin, no one will need to try and drive and find parking as they will just be able to get the LR right to the match. Simple as. All LGWM need to do now is to figure out how they will get two-way traffic thru that tunnel they spent $90m installing. I’ve done my bit – you do yours. 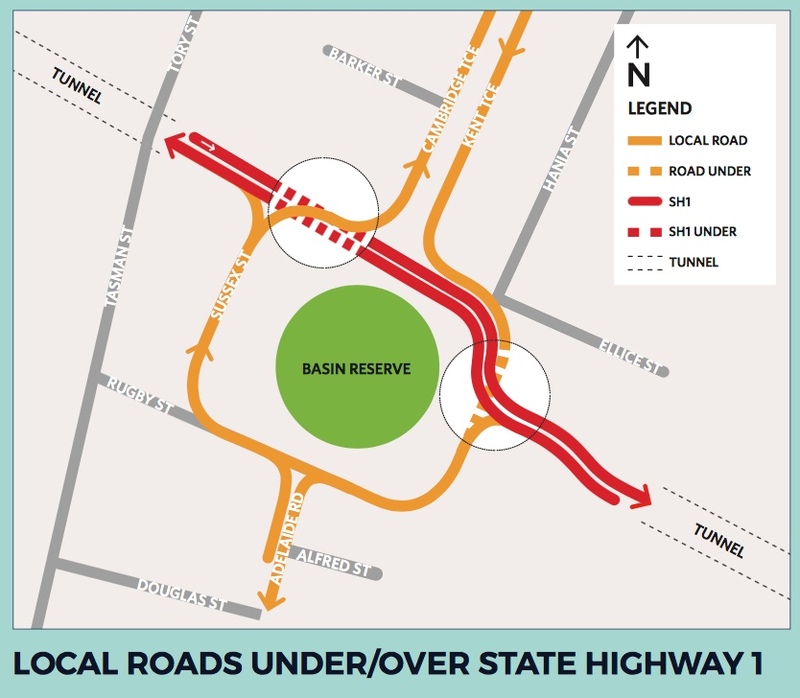 One of the arguments that the Basin Bridge proponents put up against the former Option X proposal (of which this is similar) was that there would not be enough room for two-way traffic along Sussex St, between the Marksman Motor Lodge and the old Basin Reserve Stand. Seeing as the Basin Reserve Stand has now been effectively condemned by the Council, and is planned to be demolished, the road can obviously be widened by the required 1-2 metres without any issues. Also, the Marksman is for sale or is planned to close down – it was in the paper a while back saying it was on the market, so there is probably room to expand that way too if required. Seems quite a simple plan to agree with and get going, if you want to. the entire lgwm process looks like a continuation of the previous governments roads only policy. Light Rail really is tge onoy solution although I can see merit in duplicating the terrace tunnel if it then redhces the number of cars travelling ‘thru’ the cbd. luke – you are absolutely right – that IS what it looks like. But I’m still (naively?) convinced that there are opportunities here for change, as this time it is a triumvirate of bodies, not just the one. Re the tunnels – I disagree. Mt Vic tunnel needs duplicating as it is a traffic hazard and a health hazard, but what they need to duplicate it with is the light rail tunnel. Not more tunnels for cars – just more tunnel for faster public transport. The existing bus tunnel works brilliantly. More like that one please! But the tunnel that does not need replicating is the Terrace Tunnel. it became very apparent during the Basin Bridge enquiry that replicating the Terrace Tunnel would have disastrous effects for Wellington. John Foster, the designer of the original Terrace Tunnel system, said at the Enquiry that it was deliberately only one lane in, and two lanes out, to ensure that there were never too many cars coming into Wellington – there just isn’t physically enough room for them on the streets. It was deliberately designed as a bottleneck to filter the traffic flow and slow it down. So, it is working brilliantly at that. 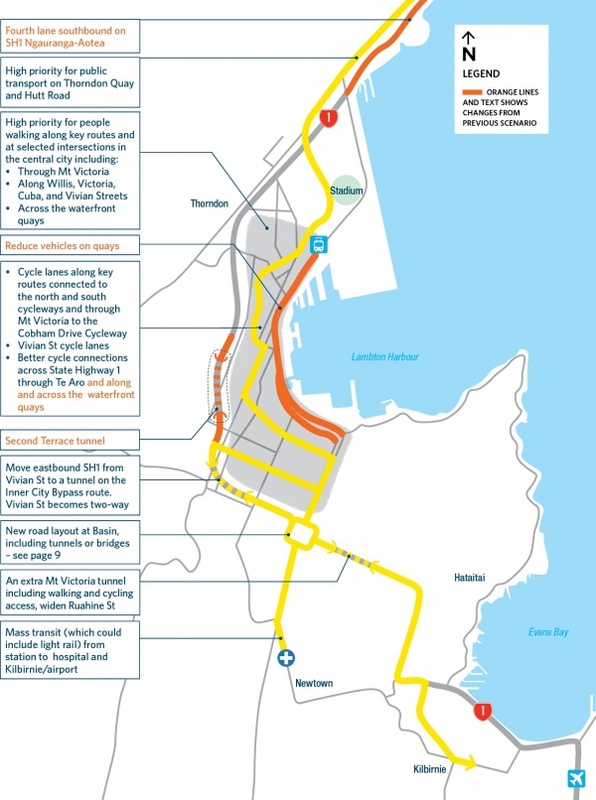 It would also be a disaster for Wellington if it changed and let more cars in…. + until the Terrace tunnel is twinned, it only one lane south anyway…. The biggest question that needs answering is can you squeeze an extrea lane south through the Karo drive trench? Greenwelly – i think you’ve hit the nail on the head there – 2 lanes one way, 1 the other, just as per the continuation of Terrace Tunnel. Very easy to do that ! Using the distance-measurement tool on Google Earth, the wall-to-wall width of the Inner-City Bypass trench appears to be exactly the same as that of the Terrace Tunnel – i.e. 12.5m. The Arras Tunnel is significantly wider. The Terrace Tunnel manages to accommodate 2+1 Northbound and Southbound traffic lanes. 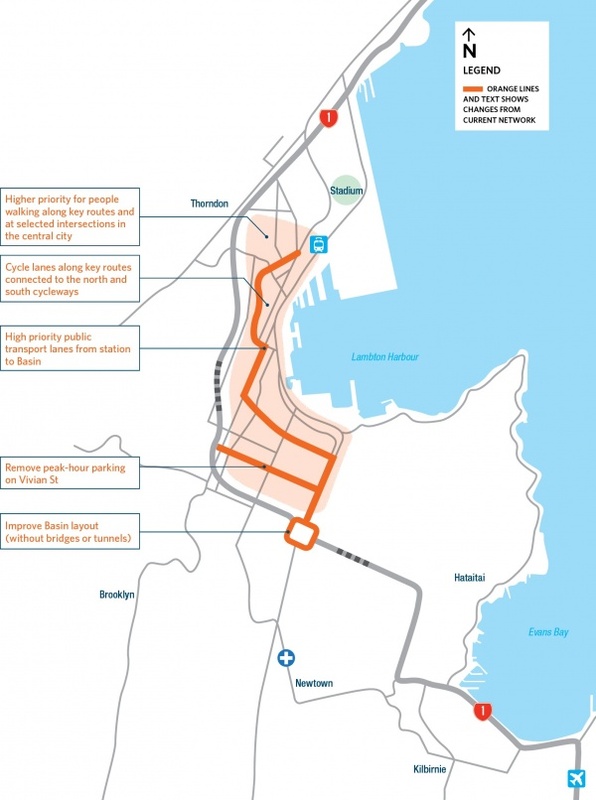 So there appears to be no reason why the complete Inner-City Bypass route should not be made 2+1 over its entire length, perhaps with variable lane-direction such that 2+1 can become 1+2 for p.m./a.m. peaks. 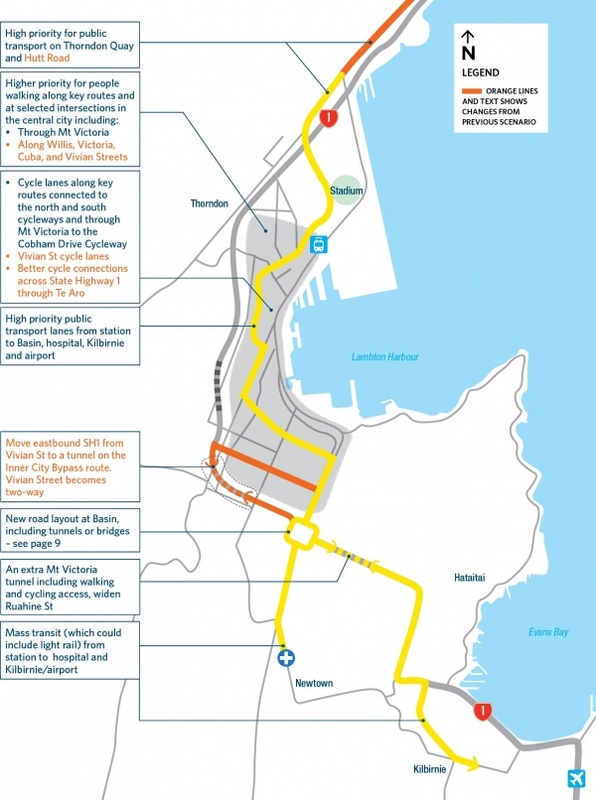 This would greatly improve State Highway traffic-flows through Wellington at minimal cost. By placing both arterial traffic-directions in the same corridor, intersecting routes would only have one thoroughfare to cross, not two as-now. Vivian Street would also be freed from its current inappropriate arterial-status. But above all, the waterfront route could be de-trafficked, opening up the possibility for it to form Stage 1 of a southwards rail-extension, covered-over and landscaped. A great disappointment that “Let’s Get Welly Moving” didn’t devote its energies to exploring alternative options such as this. Thanks David – there certainly is a good logic to have the SH1 route as 2 lanes outward, one lane inward through to Miramar. So, as you say, the Inner-City Bypass trench is the sticking point. sadly, stupidly, the giant concrete wall either side of the trench would appear to be the limiting factor. There’s only room for 2 lanes (the existing 2 outward-bound lanes) and if they wanted to get one other lane going contra flow to that, it looks like they would have to demolish the Bressolini Bar and Grill, or the back of the old Dental School (now Augusta Apartments). The large concrete walls to the trench almost suggest that the foundations of this have already been laid… Anyone know? But wouldn’t the traffic need to be 2 lanes all the way to the planes? JoCo – no, I don’t believe so. There is a lot of the traffic coming in that is city bound, and also a lot that goes up the Brooklyn Hill. That could still come off where it does now, and filter its way through the city. I don’t have the numbers (who does?) but people arriving at the Vivian St / Willis St junction is, at times, 50 / 50 i.e. some for the city, some for Miramar/Rongotai. But that is not being very forward thinking. Shouldn’t we plan for 2 lanes each way now? Only if you plan for vehicle traffic to keep on growing and growing. My take on things is that what needs to be done most of all, and urgently, and FIRST, is that the route needs to be identified for Light Rail. There’s no doubt about it, a high speed, high quality public transport system is needed, and that means having a route that is not obstructed by traffic. It can be used as a bus route for years, and then taken over for LR if and when the political will-power is needed. But the route for that is needed to be sorted first. A question for traffic engineers – I know you’re lurking. What is the basis for the 2:1 allocation at the Terrace tunnel? It seems to me that for most of the day the biggest choke comes when two 80kph (ha!) lanes of motorway traffic try to merge.For that time period at least the lane distribution seems bass awkward. Has anybody investigated a movable median barrier – perhaps pop-up bollards – which would enable it to be switched from outwards bias to inwards bias? 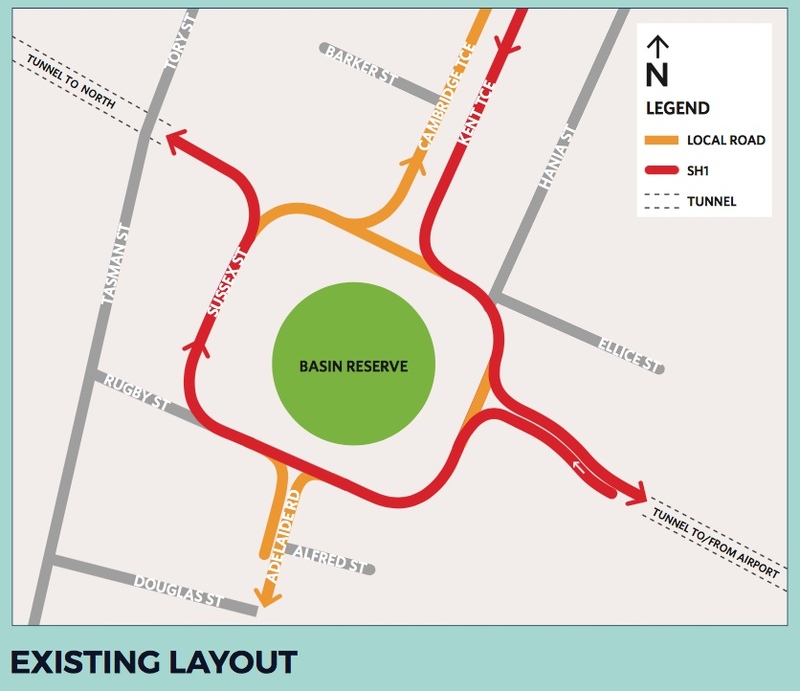 Leviathan, I believe there is enough room for 3 lanes (2+1) in the Inner City Bypass trench if the lanes are narrowed and configured as they currently are in the terrace Tunnel. As far as I can tell from Google Earth’s measurement-tool, the total width available is the same as near as dammit. There is no argument that the lanes in the Terrace Tunnel are narrower than one would normally expect by today’s gold-plated standards and I can imagine NZTA baulking at applying the same configuration in the ICB trench today, even if it is spatially possible. However the reality is the Terrace Tunnel works well in spite of this and has done since it was opened in 1978. 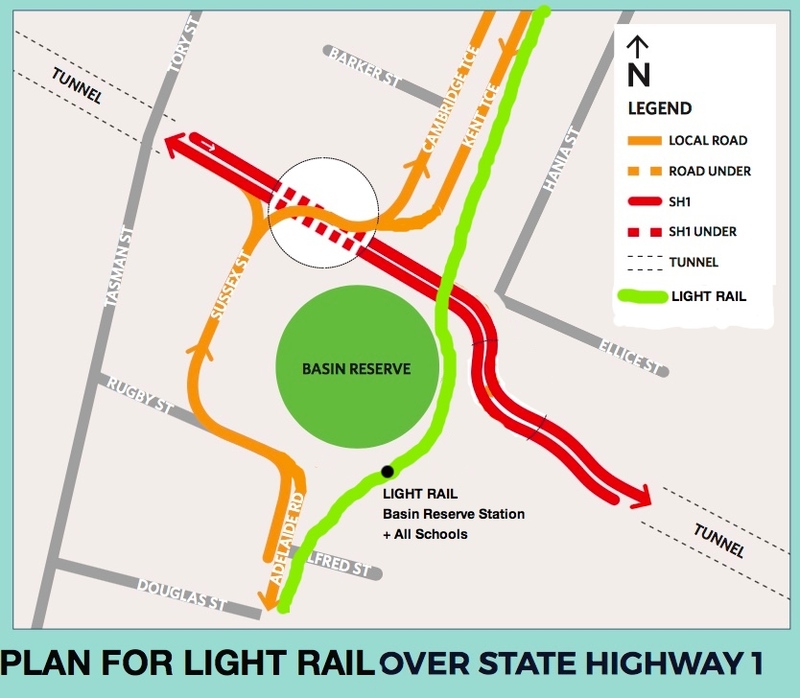 I could be wrong, but I suspect there is no physical reason why the trench could not be reconfigured in this way, thereby enabling the whole Arrras Tunnel – Karo Drive – Terrace Tunnel route to operate far more effectively as a two-way route. What I also suspect is that the current stakeholders do not want to improve things cheaply, because this would undermine the case for the grandiose motorway scheme they obviously prefer. There is a major inconsistency in the mentality that insists on “only the best” for roading, yet typically “only the cheapest” when it comes to public transport. 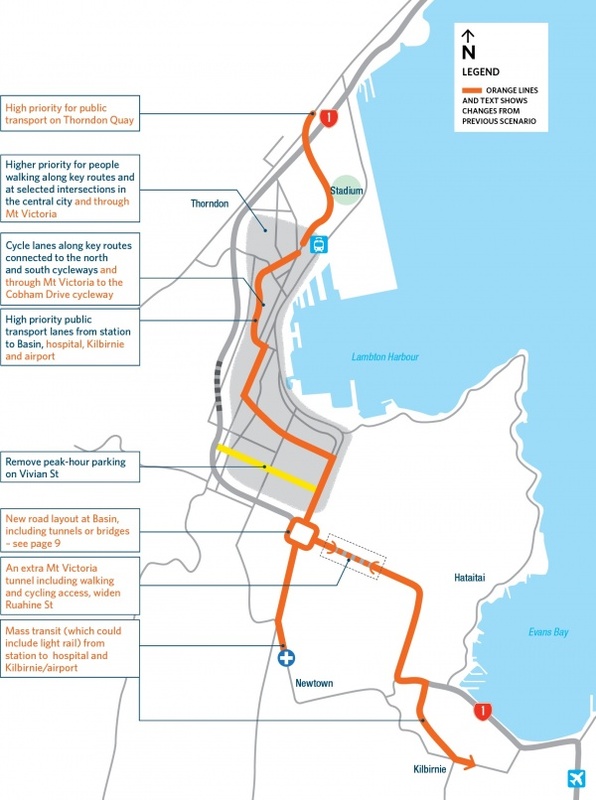 For too long Wellington has long been held hostage by officials with a roads-only agenda and denied the chance to break away from this to something more-appropriate for the 21st century. LGWM was a chance to redress this but it appears not to have even tried. 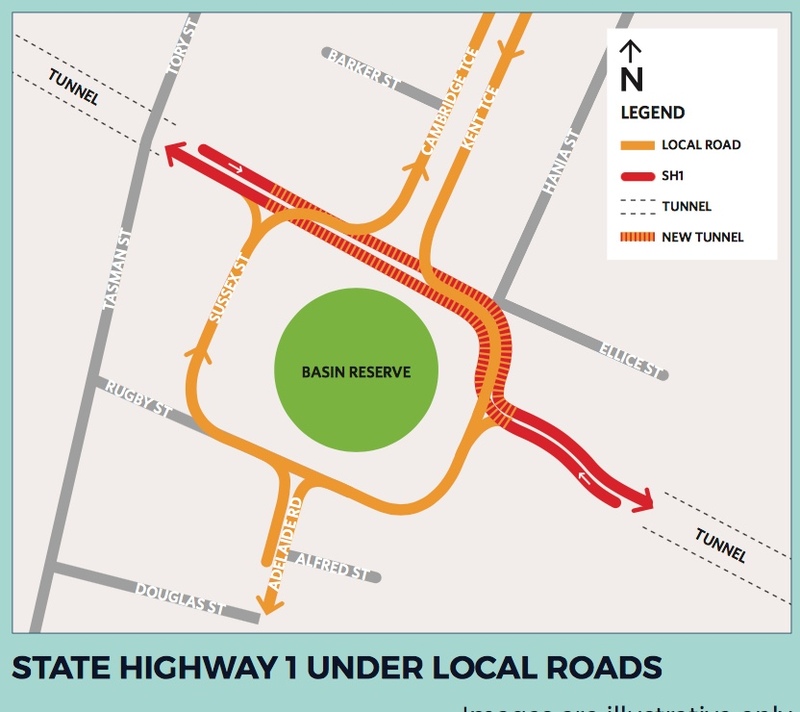 David – you’re just going to have to believe me when I say that there is no way that NZTA would ever allow 3 lanes in that ICB trench. Scaling off a google earth photo may tell you one thing, but in reality, it is just too narrow and quite simply isn’t gonna happen. Not sure how or why you think that there is enough room there, but the walls are buttressed, so they are closer together at the base than at the top – and lane widths would need to be a minimum of 3.5m each, but even so, that only makes 7m width used up so far. But, so, if you believe me when I say they can’t get 3 lanes in to the current space of 2 lanes, then what? Where do they go and how? OK Leviathan, I accept what you say. Another Google-Earth-check indicates the 3x Terrace Tunnel lanes to be 3.5m wide and therefore the same width as the 2x ICB trench lanes. I had wrongly assumed the Terrace lanes were narrower. So you are right. It would not be possible to squeeze the Terrace Tunnel lane-config into the trench. But it is frustratingly close to being achievable, and if 3.2m lanes limited to 50Km/h were considered acceptable then I am sure it would work. 50Km/h is the limit south of the trench anyway, and compared to the lane-widths in the Mt Vic Tunnel (possibly as narrow as 2.7m? ), 3.2m is generous! So it needs to be stressed that the issue here is a reluctance to lower roading specifications to what demonstrably works elsewhere, rather than a physical impossibility. And for this reason a “quick fix” solution which would solve a whole raft of other problems is rejected. I would suggest that if this were a rail-issue and the need to get more out of existing assets was the imperative, the less-than-ideal solution would be adopted with a permanent speed-restriction imposed, and this would be considered a pragmatic approach. So why such a different approach when it comes to roads? I think the road building industry is behind the expensive gold plated road only solutions, they dont want the money tap going to something more efficient/effective. 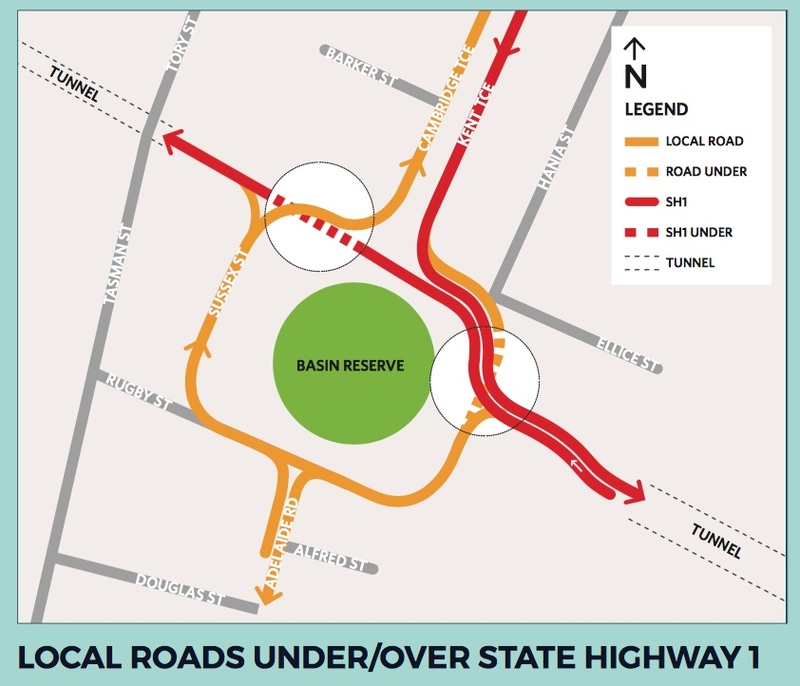 The bypass trench is 13m wide (http://www.sustainableconcrete.org.nz/page/wellington-inner-city-bypass.aspx) so could be 3 x 3.5m wide lanes + 1.25m buffer each side for a 2 x North / 1 x South setup? Yes please! Thanks i_am_sam. I have been looking unsuccessfully for documentary evidence of the trench width for ages. So if it really is 13m wide, what are we waiting for? Make it into a proper inner-city by-pass with 2-way traffic. 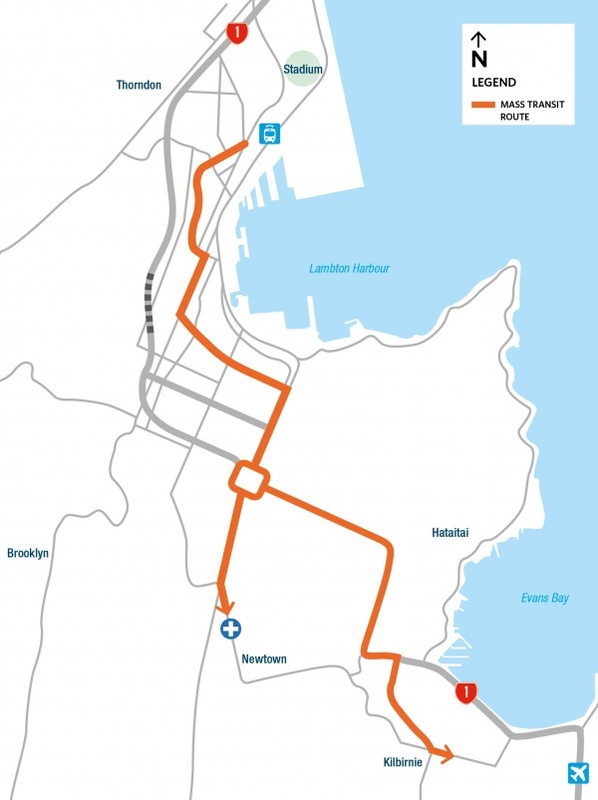 Then free up Vivian St and the whole waterfront route for better uses. Right. I now have a definitive measurement for the width of the ICB trench, by virtue of going there on 2/12/17 and measuring it myself. There is a bridge (Buller Street) which spans across the trench, and from there it is quite easy to measure the wall-wall distance. And the figure is: 12.7m (Twelve point seven metres), from crest to crest of the corrugations which form the finished treatment of the concrete wall. So this gives room for 2+1 x 3.5m lanes plus an 1100mm shoulder on either side. Or if you prefer, an 800mm shoulder on either side plus a 700mm median separating the opposing directions. There is plenty of room. THIS IS DO-ABLE! Anyone who says it’s not will be struggling for excuses (and for what purpose exactly?). This needs advocating as a practical and low-cost alternative to the various multi-billion dollar motorway schemes being touted. Leviathan, I don’t know where you get your information that the walls are “buttressed” and “closer together at the base than at the top”. I could see no evidence of any structure encroaching into the trench-profile except a kerbed shoulder which could easily be narrowed-down surely, and the walls appear perfectly vertical. Indeed it is a complete mystery why the trench was made so wide in the first place if it was only ever intended to accommodate two same-direction lanes. Excellent, thanks Sam and David. I stand corrected about the buttressing (you’re quite right – I am quite wrong). Sounds like 2+1 should just squeak through. Well done guys. I hope that you are all putting in a response to the LGWM call for submissions? Closes Friday week – the 15th Dec !